CBS just aired Garth: LIVE at Notre Dame, a special that captured the first-ever concert at Notre Dame Stadium. Fans across the country saw “The House That Rockne Built” lit up with cellphone-flashlight-candles, blue and red police sirens, and the glow of the football stadium lights during the precedent-setting performance. Captured by Brooks’ longtime television special producing partner, Jon Small, the special had that distinctive fingerprint and Garth special has: pulling the home viewer off their sofa and into the stadium itself. As well, the stage appeared to be simply a larger version of the rig he used during one-off runs in LA and Kansas pre-return to touring. It was wonderful to Brooks forgo the technical wizardry that marked Yankee Stadium in favor of slapping high-fives all night. Somehow, Garth always manages to make his songs new for each audience as well as himself. That is why he has had as many network concert specials as he has over the past three decades, and what made him the perfect man to usher in a new era for the Fightin’ Irish. No matter how many times you hear him, you just can’t help but sing along with Garth Brooks. Rain or Shine. 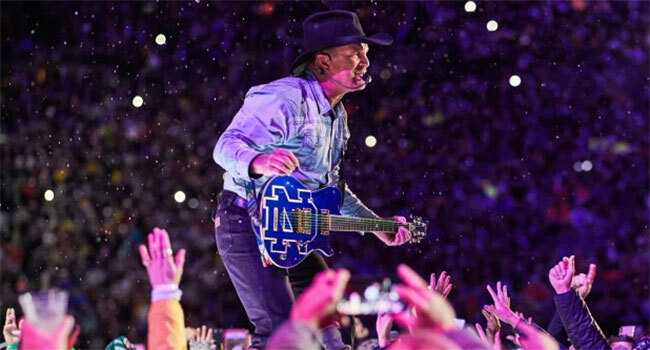 Garth Brooks performed at Notre Dame Stadium on October 20th, 2018. It served as the unofficial kickoff to a three-year, limited-date tour of college and professional athletic arenas. Brooks confirmed before Thanksgiving that he will return to Notre Dame Stadium at the end of that tour. TMU will keep you posted as more news becomes available.